Che Ba Ba (Che Thung) is one of Vietnamese dessert recipes with a coconut milk soup base and square pieces of taro, cassava and sweet potato, a kind of long sweet potato with red skin and yellow flesh. 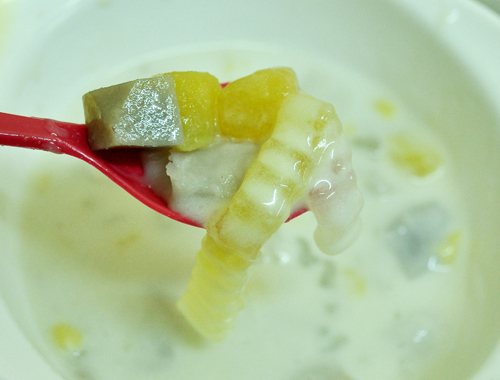 The dish commonly includes pieces of tapioca, and the dish is typically eaten warm, but can also be eaten cold. 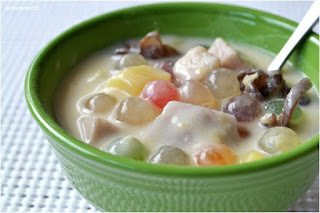 As one of the most characteristic mixed porridge of the South, According to another narrative, this dessert mixed characteristic of the southern region, Legend of the porridge is unique and delicious like a beautiful western girl wears her three rustic but extremely attractive. Che Ba Ba (Che Thung) widely preferred but not anyone can understand the secret of good cooking. There are many different ways to know one of delicious Vietnamese Dessert recipes for cooking as you can see some pictures on this post, it depends on which areas or which ingredients to you love most. Cassava (tapioca): peeled, finely ground, stuffed first with cold water, then squeeze dry. Flour power: stuffed with boiled water into a plastic block. Laminates 0.3 cm, cut into small pieces 2 x 3 cm. Coconut just finished scraping: Squeeze taken 1 bowl (bowl) small juice or if coconut slightly dries (due to long), can be minced and then squeeze the juice. Then, take 2 liters water on coconut juice for the second time, filtered carefully. 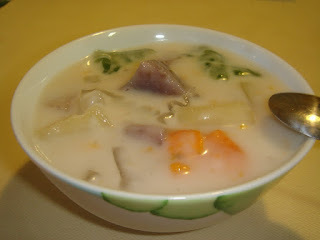 - Boil the taro boiled, take out, and drain. - Stuffed cassava (tapioca), cells with cucumber pineapple, 2 cm diameter balls. -Pot, bring to boil. Water is about to boil, to simmer, and remove the foam. - Coconut milk, pour slightly, stir well. Sweet soup is boiling, turn off the heat. Add the vanilla. In addition, Che Ba Ba (Che Thung) which is one of popular Vietnamese Dessert recipes, is absolutely delicious with who like sweet dishes, the fat of coconut mingles with the smell of green beans, fleshy sweet potatoes, cassava and lotus seeds, the faint smell of sticky leaves. 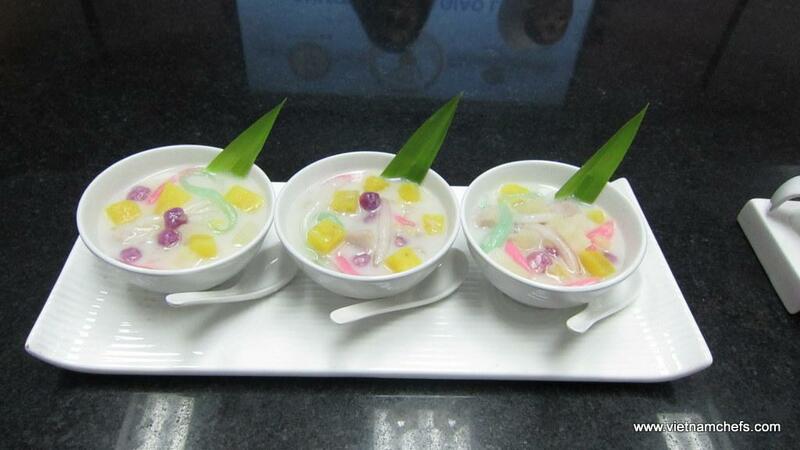 This is one of delicious dessert we suggest you should eat when you come to Vietnam.